After an unsettlingly mild autumn, it looks like winter is with us at last. No, the snow hasn't covered everything yet, but I'm sure it soon will. It's part of the cycle of living in the Midwest here in the U.S. I used to hate winter. "Hate" is a word I don't care to use unless it is absolutely necessary, but yes, I used to HATE it. My depression and desperation would grow to hopelessness. Was it in part to Seasonal Affective Disorder, the lack of sunlight? Probably, as that still does affect me. As the years go on, however, I'm acknowledging that I'll be here in the Midwest for quite some time, so hating winter won't change it. I don't have to love it, but I'm coming to accept it, respect it, and appreciate it for what it can teach us. What can winter teach us? What can chilly winds, snowflakes, shoveling, and barren-looking trees teach us about life? A lot, actually, if you think about it--and there is a lot of time for thinking in winter! That's the point, I believe. Let's look at plants and trees, for an example. In the fall, the trees begin to cast off their leaves, conserving their energy, preparing for the cold season. 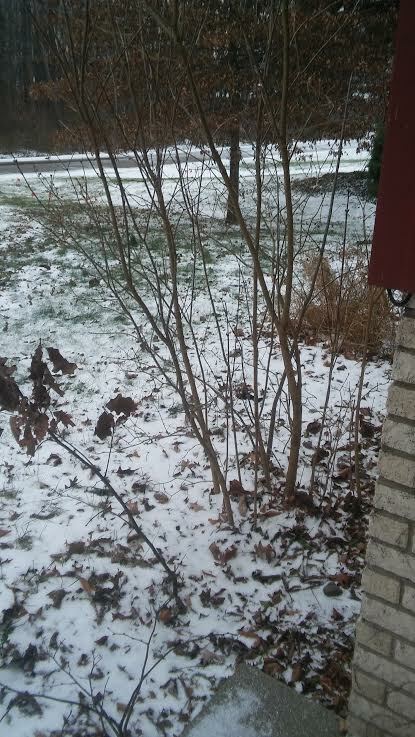 Some say "trees are dead" in the winter, but they are dormant--sleeping. Are you dead when you sleep? Of course not. You're resting your body and mind, preparing for a new day. Maybe your dreams are providing inspiring ideas for creative ventures or solutions for situations. Now, apply that line of thinking to winter. The trees have gone within, conserving their energy, waiting for the warmth of spring, sleeping and repairing inside. Why should we not do the same this season? Instead of griping about the cold, or lack of light, maybe we should go within, rethink our lives, or beliefs. Use this time to repair ourselves, whether it be bad habits, poor ways of thinking, or taking up the things we used to love, but maybe have been neglecting to do. Read, meditate, or maybe just sit and think about what it is within you that needs improvement before the warmth of spring arrives. Maybe you'll come up with ideas and dreams to develop on and later fulfill in the warmer months. Life, in my view, is about growth--encouraging others to do it, and growing our own horizon of thoughts and experience. In nature, growth cannot happen without periods of rest and rejuvenation, which is what winter is all about. So maybe this season, to my friends in the upper hemisphere, consider taking a tree's view of winter this season, and see how you begin to feel. Use this time to rest and rejuvenate. Mend outdated ways of thinking, question your beliefs and thought patterns, be kind to yourself and nourish your soul, so that when the spring sun arrives and the frost has melted away, you can blossom along with the flowers and trees. 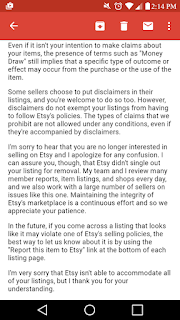 Recently I received an email from Etsy informing me that they had removed one of my listings for violation of their policies. I was confused, because I always put the legally required disclaimer on all my listings, that I can "make no claims for [product], and am selling it as a curio only." But checking my account, I found that they had removed my "Money Draw" oil, which I found strange because I had just sold some of it, and I also literally made no claims for it in the listing, but simply stated the herbs used, and that it could be used in money and prosperity rituals. 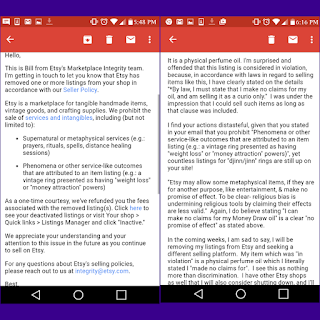 Etsy's email on the left; my response on the right. Well, I decided I would begin removing my products from their selling platform, but I also wanted to have some kind of say in what they had done. After all, "Money Draw" is a traditional name for hoodoo money spell related items. Etsy doesn't see it that way, however; they insist that the name in and of itself "suggests a physical change." Meanwhile, I found djinn rings, love draw spell kits, soul mate attracting kits, and a ring that had been interred with a woman's shrunken head and now possessed her soul. Not only that, but a search brought up 321 other items with the name "Money Draw," which increased by three more items overnight. Needless to say, I was a bit angry. Yes, I felt singled out. But "Bill" from Etsy's "integrity team" assured me that hundreds of these cases are processed daily. 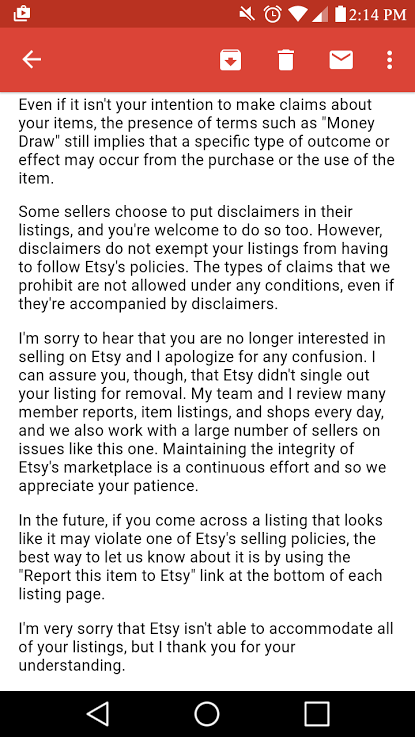 Oh, and also that those legally required disclaimers mean nothing while you're on Etsy. It feels like the Etsy witch hunt is on yet again. Did the customer who purchased my oil feel displeased, and report it? I wonder because, contrary to what "Bill" claims about reviewing listings, shops, and reports, there are still literally hundreds of "money draw" spell items up for sale. Either way, I'm shutting down my magical shop on Etsy, and I've moved to Scott's Marketplace! Come find me there; the shop name is still "The Gossamer Moon." Let's support a selling platform that doesn't discriminate. Even though the autumn equinox falls in late September, to me, October just "feels" like the true beginning of the season. The cooler weather, cloudy days, colorful leaves that crunch under your feet. And of course, there is my favorite holiday this month: Halloween. October is a month where I feel everything is changing; I've never felt the depressed "everything is dying" label some pin on this type of season. To do that, I believe, can be detrimental. As much issue as I have with winter depression, I've never felt it in the fall. It feel like a time of preparation in nature, a grand finale of color before the trees and perennials take their long sleep. It is a time for apple desserts, ciders, spices. A time for baking honey cakes, spooky ghost stories, exploring old buildings and dwellings. It is a time for planning how I will celebrate Halloween with my friends! Like some of you perhaps were, I was told as I grew older that Halloween is a child's holiday only, but I not only disbelieve this, but feel engaging in fun, youthful celebrations is a great way to preserve one's mental well-being. Autumn also seems to awaken my witchy side. I want to put on my cloak and light candles, stroll under the moon and leave offerings to Hecate at the crossroads, have a bonfire. Not sure what it is exactly about fall that causes this pull toward magic, but it has always been there--and it is especially strong in October, which I suppose could be called the Witching Month. What will you be doing this October, this Halloween? If any of you have plans to honor your ancestors, I would love to know your rituals or ideas. I'm hoping to do something for mine this year, as well. 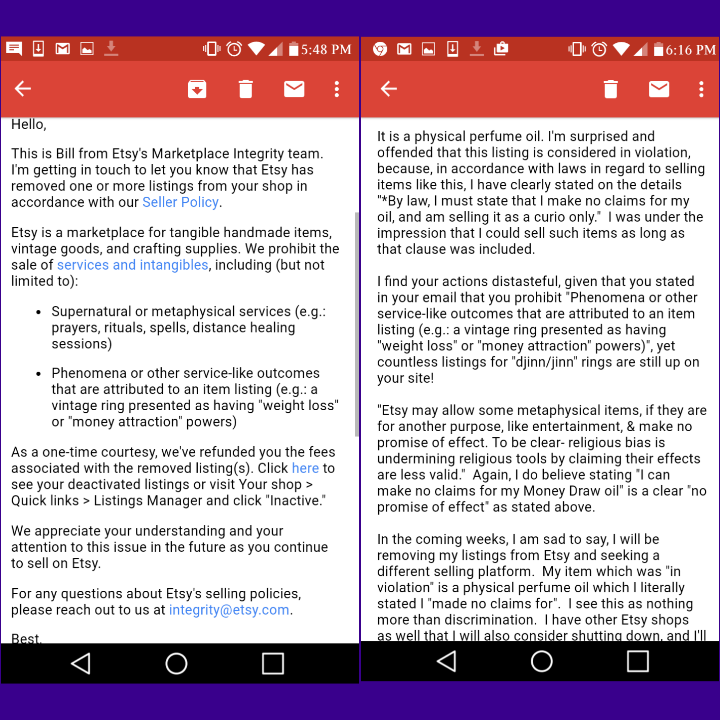 In case you haven't heard, Etsy's ban on metaphysical items has been lifted! I have since been listing a lot more things in my shop, very happy I can give fuller explanations for them. Beauty soap serves two purposes: to magically enhance your spiritual attractiveness, and to beautify and gently condition the skin. Beauty soap; available as 1" square samples for $3 each. Not only do the freeze dried strawberries in this soap lend the lovely color, they also help to clear up blemishes from the skin, keeping it clear and smooth. Himalayan pink salt and kaolin clay purify, exfoliate, and soften. Yerba santa, apple blossoms, and carnation petals increase your personal attractiveness. I have also included age-defying palmarosa oil, along with lovely florals of neroli and ylang ylang, with some citrus. This soap is layered; one layer is of a shea butter base, and the top layer is a clear glycerin base. *Shea butter base (coconut oil, palm oil, shea butter, cocoa butter, safflower oil, vegetable glycerin, purified water, sodium hydroxide, sorbitol, sorbitan oleate, soy bean protein). Note: Magical soaps are a new item I've been making and selling on Etsy, and something I have wanted to do for a while, after admiring the magical soaps of other hoodoo-type shops. 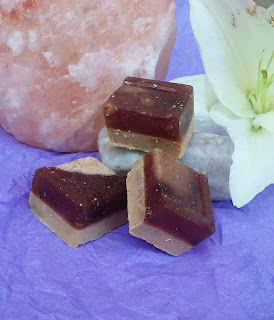 My soaps are created with pure essential oils, absolutes, and botanicals, and I use melt-and-pour soap bases that contain NO detergents or surfactants. They won't have the lather of a commercial soap, due to the lack of detergents, but they have great cleaning power AND are non-drying, as a bonus! Coming soon to Etsy, at $6 for a full-sized bar, and $3 for a sample square. 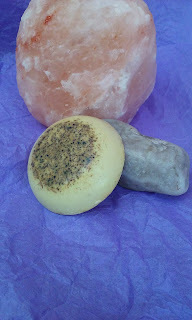 Creativity Soap was conceived when I myself was in a creative slump...I thought, what could I do to spark inspiration? Then it hit me: soap with creativity herbs! Classic gingko leaves for clear thought, green cognac oil (a grape) for fertility of the mind, jasmine absolute for inspiration, and so on, in a base of goat's milk soap. My thought behind the goat's milk is that milk is the nurturing food given to new life...So, food for the nurturing of new projects! This particular batch of creativity soap was created on a FULL MOON WEDNESDAY. Wednesday is the day of communication and working with your muse, while the full moon is when it is at its largest and brightest, full of potential and energy! One thing I will say about this soap--don't use it before bed. I'm not sure if it's the gingko in it or the combination of essential oils, but I used it the first night I made it aaaaand let's just say I was wide awake with lots of ideas and thoughts popping into my brain! essential oils and absolutes, herbs, and saffron for coloring. Witch hunts are often spoken of as a thing of the "superstitious" past; ignorant Europeans who were misled by their religion, who believed witches were evil and conjured Satan at their sabbats, were the persecutors. In general, the persecution and execution of people, usually women, for witchcraft and sorcery, dates back to ancient times. Ancient Rome outlawed sorcery, and it is reported that from 184-180 BCE, some five-thousand people were executed. The European witch hunts throughout history have never been something I could fully grasp. I understand the excuses made for the murder of innocent "witches", who sometimes were herbalists, and sometimes wrongfully accused women who were either misunderstood or hated by their community. Many of these trials and executions were led by the Catholic church, although for sometime, the church had outlawed the very act of executing witches in 785, by the Council of Paderborn. It was sometime around 1484 when a papal bull was issued that allowed the punishment of witches, but mainly for ones who had supposedly "slain infants." In the 17th century, the "witch scare" spiked, with imprisonment, torture, hangings, and burnings in Denmark, Germany, and England, to name only a few countries. And let's not forget the famed Salem trials in the United States, although 46 years before, there were accusations of witchcraft in the "land of the free". And now, I suppose you may expect me to write about when all this was banned around the world, when herbalists, necromancers, pagans, and other practitioners of magic were finally left in peace. I wish I could write that. Unfortunately, although the trials, tortures, and executions may have died down, they continued on a smaller scale--and still continue in some areas of the world. In 1950s America, a man shot a woman who he believed placed "a hex" on his wife. In 2014, Amanda Mandee Lopez stabbed her ex-boyfriend to death, as she felt he had put a curse on her, and she "needed to be free from the demons." In India, it is not uncommon to label a woman as a witch in a land dispute--or for something as petty as if she turns down a man's sexual advances. Although less than 2% of these women are convicted, many are cast out of their homes, and even driven to suicide. In 2009, as many as one-thousand people in Gambia were captured on charges of witchcraft, taken to detention centers, and forced to drink poison. Witchcraft and sorcery remains a punishable crime in Saudi Arabia. However, the exact crime is undefined. In 2006, Fawza Falih was convicted of performing an impotence spell. She was beaten and beheaded. Those are only a few. And while those cases are very extreme, what about modern-day discrimination? What about people who are denied raises because their employer discovers they are pagans or witches? What about the emotional stress of being told you are "doing the devil's work" by performing spells--even healing spells? And what about the latest incident with Etsy, the e-commerce website, which has recently reinforced its "rule" against metaphyical items that "promise or suggest a change", by suspending accounts, closing down shops, and giving two weeks notice to those who they feel violate their rules? That last one really has me outraged, as it affect my shop on Etsy, The Gossamer Moon. I sell magical soaps, oils, and gemstone jewelry. By law, with all metaphysical goods, it's required to list with a disclaimer that they are being sold "as a curio only". With stones, it must be stated that they are not to replace the treatment and/or diagnosis from a licensed, professional physician. That is reasonable; however, Etsy's new policy does not allow even a SUGGESTION of healing powers. It is alleged that shop owners have been advised to take down listings that talk of the mere myth and lore behind stones. Apparently, the terms "chakra" and "reiki" are also becoming taboo. So far, my shop is still up and running. I figure it is only a matter of time before I, too, am kicked out. You may see more posts on here about my products, as I hope to be able to post links on my Etsy listings that will redirect here for the explanation of their benefits. I'm hoping that will be an acceptable solution until I can afford a domain of my own. There is a petition out there, against the Etsy ban on metaphysical shops. Could you please consider adding your signature? I know that not everyone believes in magic, but when one group is persecuted, it is hard to know who may be next. A lover of nature, and all things mystical and magical. I seek out mysteries, I chase after secrets. I want to learn, I want to teach, I want my heart to beat with the rhythm of the earth.